Looking for the best 75 inch TV you can buy? If you want to create a home-cinema, or experience your favourite films, games or TV shows on a big screen, this is an ideal size. No matter which way you look at it they're really big, meaning you'll want to consider all your options before choosing the model that's right for you. 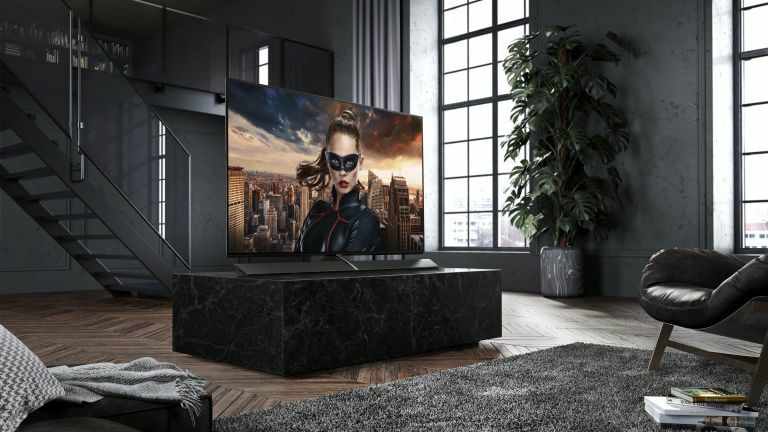 Luckily, we're committed to making the process of buying a TV as easy as possible and have rounded up our pick of the best 75 inch TVs for you to browse. Still deciding which size model is best for you? Our guide to how to choose the best TV was written with you in mind. You'll fid plenty more buying guides, reviews and expert advice over on our televisions hub page, too. What is the best 75 inch TV? Once of the largest sizes available, 75 inch TVs are built with those seeking the home cinema experience in mind. But, with OLED, LED, LCD and a variety of other, often confusing, acronyms flying around, it can be difficult to know what to choose. For those willing to pay for it, the LG OLED77C8 is undoubtedly the best 75 inch TV available. It offers exceptional image quality, a beefy soundbar and a stylishly crafted interface that ties the two together, seamlessly. Yes, it's expensive, but if you're a film or gaming fanatic looking to enhance your experience it's more than worth the investment. Suffice to say that getting a TV that's over 70 inches in size is a commitment, and not one to be undertaken lightly. Even if you've got the space for it, 75 inch TVs are expensive by their very nature. Don't go for this size unless you're prepared to spend a significant amount of money. Trust us, if you're looking for a cheap option then you'd be much better off getting a more premium set in a smaller size. If you're comfortable with the space and monetary costs then you have a decent number of choices of TV, far more than you would have had in previous years. In terms of panels, it's a pretty even split between OLED and LCD. Of the two, LCDs are the cheaper option but you'll still be paying OLED prices for them at this size. If you want the perfect blacks and wide-viewing angles of OLED then TVs at this size can easily jump into the tens of thousands - you have been warned. Before we dive into our list of the best TVs available at this size we should just quickly point out that we've included a couple of 77 inch choices because frankly at this size you're unlikely to notice the extra couple of inches. OLED TVs, with their deep black levels and fantastic pixel response times, are expensive at any size, but at over 70 inches they start to enter another realm of pricing entirely. Despite the LG OLED77C8's huge size, it still manages to remain minimalistic and it has gallery mode so when it's not in use, you can enjoy stunning images and artwork from around the globe. It also works with Google Assistant so you can use your voice to control the TV. It's hardly cheap, but for the price you're getting an absolutely exceptional screen, a beefy soundbar, and an interface that beautifully ties the two together. If you want a 77 inch OLED then this is the best option for most people. Offering incredible colour volume, especially for its size, the Samsung QE75Q9FN comes in a close second place, out of our pick of the best 75-inch TVs. Its stylishly thin frame would work well in a contemporary living space, while its extras are perfect for those who love gaming. What stopped it from taking the top spot? Despite having the full array LED backlighting, its image quality can't quite compare to that of an OLED TV for contrast, nor black levels. Of course, once you've committed to spending £££s then Sony's KD-77A1 is another fantastic option. Its big advantage over Panasonic's efforts is how it's able to upscale HD/SDR content to a level that looks almost identical to native 4K/HDR footage. That's a great piece of functionality, especially when you consider that the majority of content is unlikely to be 4K HDR for the foreseeable future. Beyond its upscaling prowess the set also features a pretty unique speaker configuration which actually sees it vibrate its screen itself to create sound. We'd probably opt for the Panasonic over the Sony overall because the Panasonic is marginally better at handling 4K content (which will eventually become the standard), but if you want a TV that's going to deal better with the majority of the things you watch right now then the Sony is the best 75 inch TV for you. If you want a premium OLED experience, then LG's 77 inch W7 is a great option. It's a striking looking television. The screen itself is just millimetres thick, a feat achieved by packing the TV's internals into a hefty, Dolby Atmos-capable, soundbar. This unique design means that the W7 does not come with a stand – instead you'll have to wall-mount it in order to experience its delights in your house. It's enormously expensive, but this is the TV you should go for if you want a set that looks just as good when it's turned off as when it's turned on. Upgrade your home entertainment for cheap with this Hitachi TV. It's a fraction of the price of the other TVs on our list, but it definitely doesn't lack in features. Although it doesn't look like anything special, it can stream Netflix, BBC iPlayer, iTV, demand 5, 4od, and YouTube through the Hitachi smarTVue portal. It has crisp picture quality as well as 2 USB ports and 3 HDMI sockets and an efficient energy rating of A+. For the money, you can't really expect any more, so pair it with the best Blu-ray player and you're sorted. The best 75 inch TV if you want a home cinema for an affordable price.